UPDATE 11/27/18: Now that reservations have officially opened, we can report that the first date for check-in is July 9, 2019; the day the resort will open. UPDATE 11/21/18: Guests can make reservations for Gran Destino Tower at Disney’s Coronado Springs Resort beginning November 27, 2018. 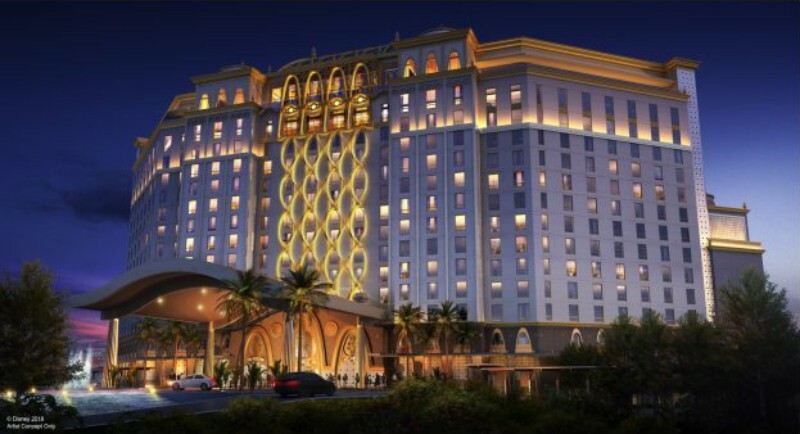 Renderings of the new 15-story tower being constructed at Disney’s Coronado Springs Resort were shared earlier this year and Bob Chapek has shared more details about the tower, including the name which will be the Gran Destino Tower. The tower is set to be finished in July of 2019 and will become the new main entrance for guests visiting the resort. This new addition will bring 545 new guest rooms (including 50 suites) to the resort, as well as a grand two-story lobby. A new themed table-service restaurant is also in the works for the top of Gran Destino Tower, which will provide incredible views of the Walt Disney World Resort. The tower sits along the shores of Lago Dorado and will celebrate the daring spirit of the great Spanish explorers, artists, writers, and architects. Guests will see a blend of classic Spanish influences, imaginative Disney touches, along with modern comforts both inside and out. The resort’s more than 1,800 existing rooms have also been fully updated with new fixtures, furnishings, and lighting. A second new restaurant, Villa del Lago, is planned to open on an island in the middle of the resort’s 14-acre lake, Lago Dorado, with new walkways stretching across the water, making it convenient no matter where guests stay at the resort. And a fresh color palette will tie the entire resort experience together, blending the new and the newly reimagined. Guests will soon be able to make reservations for Gran Destino Tower for stays beginning in July 2019.